Sixteen-year-old Shlomo Nativ was killed and a seven-year-old boy was moderately injured in an attack carried out by a terrorist carrying an axe in the West Bank settlement of Bat Ayin Thursday noon. According to the police, the terrorist managed to flee the scene. The IDF launched a hunt for the terrorist, set up roadblocks and boosted security throughout the communities in the area. Palestinian sources reported that IDF forces were surrounding a house in the nearby village of Khirbet Safa where they suspected the attacker may be hiding. 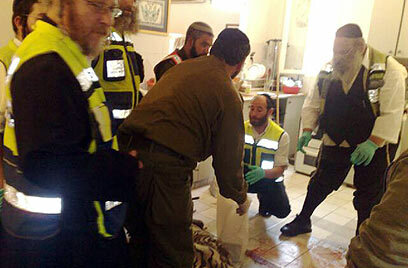 A Magen David Adom rescue team tried to resuscitate the teen, who they said ran into a house after being attacked, but he died of his injuries. Ozer Zilbershlad, a ZAKA rescue service volunteer at the scene told Ynet, "You could see a trail of blood where the deceased ran." Nativ's funeral will be held at the Kfar Etzion Cemetery at 5 pm. Another team evacuated the wounded child to the Hadassah Ein Kerem Medical Center in Jerusalem. A hospital spokesperson reported that the seven-year-old suffered from a fractured skull and will soon undergo an operation. The child is currently in moderate condition. The police said that according to eyewitness reports, the terrorist fled the scene after running wild and attacking passersby. Residents alerted the security forces to the scene. The mayor of Gush Etzion Regional Council said that Bat Ayin's local security watch squad shot at the terrorist who carried out the attack, but that the terrorist managed to get away. "The terrorist came in with an axe and injured two boys from Bat Ayin," said Mayor Shaul Goldstein. The mayor noted that no Palestinian workers are employed in the town: "It is clear that the terrorist came in with the intention of murdering and terrorizing. The only way he could have come in was through infiltration." Residents of the area were asked to stay indoors as the IDF searched for the attacker. 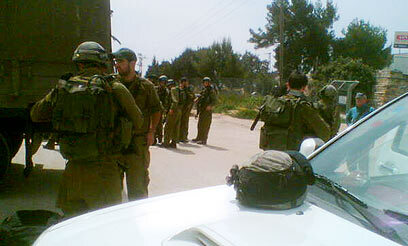 Yona Bitkober, a resident of Bat Ayin, told Ynet: "There are a lot of ambulances and police and military vehicles here at the entrance to the community. We were told to stay indoors." A Palestinian security official told Ynet an initial PA investigation into the attack showed that the terrorist apparently was not sent by any organization but was working on his own. The injured boy, Yair Gamliel, is the son of Ofer Gamliel, who, along with the two other members of the "Bat Ayin Underground," was convicted of attempting to bomb a Palestinian girls' school in East Jerusalem in 2002. The Imad Mughniyah Brigades, part of Fatah's military arm, the al-Aqsa Martyrs' Brigades, took responsibility for the attack. However, the security official said that this is not credible. Terror organizations have attempted a number of attacks recently. Some two weeks ago, a bomb containing 50 kilograms of explosives was found at a Haifa mall. The mall was evacuated, and the device was detonated. Police said the bomb was discovered by chance, and a major attack was only just avoided. Last month, two police officers were shot dead in an attack near the community of Massua in the Jordan Valley, after stopping for the shooters who had staged a flat tire. Some three months ago an Israeli was very seriously wounded from gunshots fried from a Palestinians vehicle near the West Bank settlement of Kokhav HaShahar. The victim was evacuated to hospital by helicopter and police searched for the attackers. See all talkbacks "Teen killed in West Bank terror attack "